Housing is a universal need, part of what psychologist Abraham Maslow called “primary” needs that must be met for survival. With the Earth’s population expected to increase by 1 million over the next thirty years or so, the demand for housing can only increase. While the amount of available land is relatively finite, the value of the structures on the land and their component parts may increase. An important component of any property investment is the land on which the structures exist – but in the land/home investment equation, it’s the structures the land supports that can create wealth. Traditionally, purchasing a house meant buying a home plus land. Although alternatives such as condominiums took out much of the ”land” part of the equation, in general, an income property includes both structures and the earth they stand on. But these two parts of the equation don’t hold equal value. The relatively unchanging nature of land can host a variety of structures. Another aspect of the land to structure equation is the potential for a relatively small amount of land to hold a relatively large amount of structures, as the same piece of land can contain a single-family home with one set of tenants or a multiplex consisting of two, three or even four units with the possibility of doubling, tripling or even quadrupling the amount of rent that can be collected from the property. 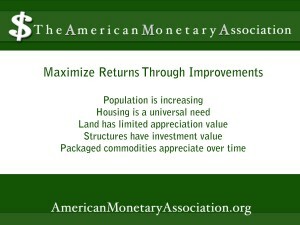 All the components of building a house or other structure, right down to the wire and nails, are commodities, which can increase in value as demand goes up. 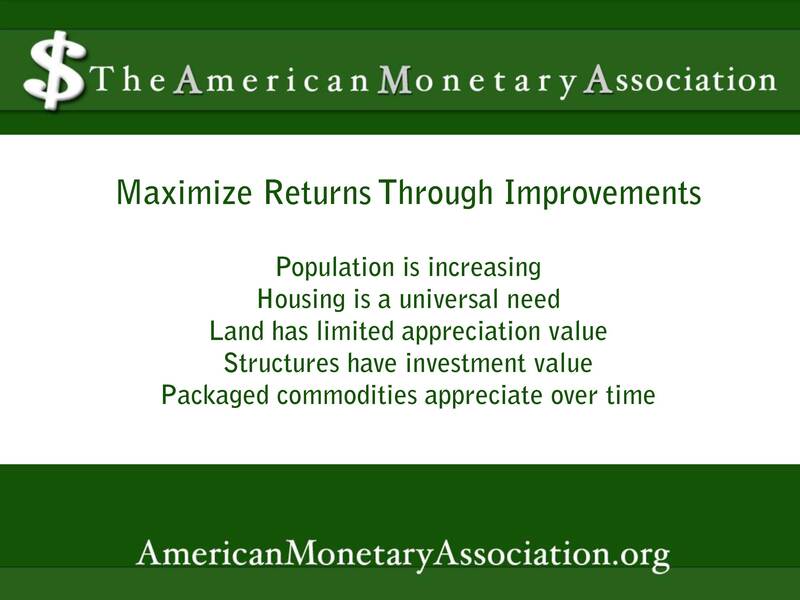 And, since improvements to existing structures, or the construction of new ones, can lead to more desirable tenants and higher rents, the potential for a higher return increases too. Land certainly plays an important asset in an income property purchase. But land values are going down in many areas. The commodities that create structures, and the structures themselves, have the potential to increase in value – especially in light of a demand for housing that can only grow as the population does.